Today is Veterans Day in the United States, and Armistice Day and Remembrance Day in other parts of the world; we honor military veterans on this date because the armistice that ended World War I went into effect in the eleventh hour of the eleventh day of the eleventh month. I thought I’d mark the day by discussing a poem by one of the war poets; as regular readers know, the literature of the Great War is one of my particular areas of interest, though I’ve been delayed when it comes to my World War I Reading List post (I should have it in time for the centenary of the end of the war . . . ). However, since I’ve talked about Sassoon, Owen, Graves, Rosenberg, and Blunden already this year, I thought I’d detour (though that’s a misleading word) into the work of one of their contemporaries. Typically pictured as a twinkly-eyed, pipe-smoking scholar, J.R.R. 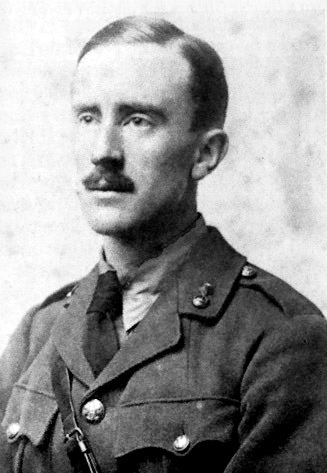 Tolkien is not often remembered as a veteran, though readers of The Lord of the Rings, The Silmarillion, and The Hobbit may know that he served during the First World War; he fought in the Battle of the Somme. Most of his comrades were killed after he was sent back to England to recover from an illness; he spent the rest of the war weak and ill, though he served in various garrisons on the home front. In the preface to the second edition of The Lord of the Rings, Tolkien wrote, contradicting those who supposed the work was an allegory for the Second World War, that the book was not an allegory, and that in any case the war that shaped him first began in 1914: “By 1918 all but one of my close friends were dead.” In 1918 Tolkien was twenty-six. Here’s a link to Tolkien reading “Namárië,” or Galadriel’s Lament, the poem of the week in honor of Tolkien and all other veterans. He reads the poem in Elvish (Quenya, for those keeping score), and you can read the English version below the video. If you’d like to read more about Tolkien’s experiences during the First World War and their influence on his writing, reliable sources recommend John Garth’s Tolkien and the Great War: The Threshold of Middle-earth. Carolyn, what a fascinating post! I can’t find the link you reference….would love to see it! Emily! Thank you for reading, and thank you for pointing out the missing link (it’s up now)! I hope you and your fine fellows are well! What a great post! Thanks Carolyn O.
That’s a nice poem. He made up a whole language and syntax, didn’t he?